Boston Police Superintendent-in-Chief William Gross has been tabbed as the department's next commissioner following the retirement of William Evans. Boston Police Superintendent-in-Chief William Gross was named the city's first black police commissioner on Monday, replacing William Evans, who is leaving for a new job heading up the Boston College police force. "Chief Gross is a proven leader who is trusted and respected in the community," Mayor Marty Walsh said in announcing the appointment. Gross has been with the department for 33 years, including the last 5-1/2 as its chief. He also served as the department's night commander, led the city's youth violence task force and has been a big part of the department's anti-violence strategy. "I don't think the city has seen a police leader as loved and trusted in the community as Chief Gross," Walsh said. "The important thing here is consistency. We're losing an incredible leader today and bringing in a great leader right behind him who will be an incredible leader in Chief Gross." Gross, 56, was also the department's first black superintendent-in-chief. His appointment as police commissioner ushers in a new era for a city that has long struggled with perceptions of racism. 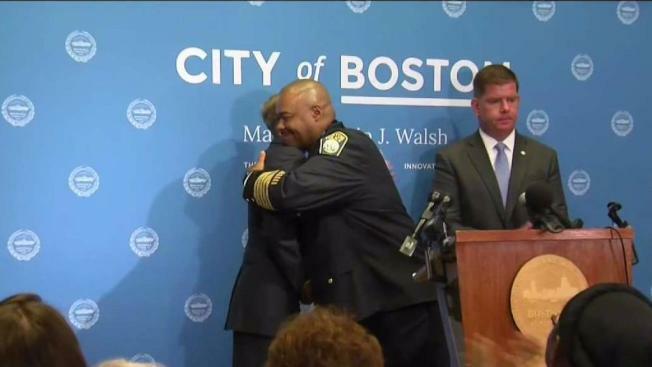 "That means a lot to this city," Walsh said. "It symbolizes progress... He's the right person at the right time for this job." Gross said he was honored to accept the appointment, calling Boston "the best village in the country. We are the hub of the universe." He starts in his new position next week. "I'm just overwhelmed with emotion and pride. I'm just grateful," Gross said. He called himself "a true street cop," having gotten his start in 1985 in Dorchester and worked his way up the ranks. He said his overall strategy is "if it's not broke, don't fix it," but also said the department must continue to move forward. "If you want change, be the change. That's why I became a police officer," Gross said. Boston hasn't seen the violent clashes between police and residents sparked in other cities by the shootings of black men. But activists have long complained the city's police force is too white. The department faced heavy criticism earlier this year when it posted a Black History Month tweet celebrating the late, former Boston Celtics coach Arnold "Red" Auerbach, who's white. Evans later apologized, calling the tweet "insensitive." And the department came under fire that same month after a widely shared video showed a white officer stopping and questioning a black man who was on his way to a barbershop. Civil rights activists said the confrontation was indicative of the way law enforcement routinely view black men with suspicion. Tanisha Sullivan, president of the Boston branch of the NAACP, said anytime a person of color ascends to a leadership position is a reason for hope. But she said it will only matter if Gross is given a voice at the table with city leaders and is empowered to lead the department forward. "It's really not a win unless and until we are able to see evidence to suggest that Chief Gross - now Commissioner Gross - has been able to activate the power of his diversity and we'll know that by the direction the department goes in."